This post Even God Can’t Beat This Simple Investing Strategy appeared first on Daily Reckoning. Mike and Susan are close family friends of mine. We get together frequently to catch up on life, family, boating and we occasionally talk investments. Even in retirement, Mike and Susan know the importance of continuing to grow their wealth. Buy Low and Sell High… Right? Mike isn’t a sophisticated investor by any stretch of the imagination. As a former car salesman by trade, Mike knows the basics of picking a solid long-term investment. But the majority of his investment experience — like most people’s — is through managing his 401(k) over his lifetime of work. Like most investors, Mike has the mindset of waiting for a pullback before deploying his cash into stocks. In theory this is a wise move — buy low and sell high, right? But after talking with Mike this past weekend, it turns out that he let the December pullback completely pass him by! “I was worried the market was going to drop further. I couldn’t take the risk!” he explained as we spoke over the phone. So not only did Mike miss out on the huge run up in stocks up until the December pullback, Mike also didn’t capitalize on the big gains to be had from buying when prices were low. So what should he have done instead? What if I told you that even if Mike perfectly timed the bottom of the December pullback, he still would have been better off dollar cost averaging his position all along? Imagine you are dropped somewhere in history between 1920 and 1979 and you have to invest in the U.S. stock market for the next 40 years. Dollar Cost Averaging: You invest $100 (inflation-adjusted) in the S&P 500 every month for all 40 years. Buy the Dip: You save $100 (inflation adjusted) each month and only buy the S&P 500 when the market is in a dip… Not only will you buy the dip, but you’re omniscient (i.e. “God”) about when you buy. You will know exactly when the market is at the absolute bottom between any two all-time highs and you hit the “buy” button every time — without getting cold feet like Mike. The only other rule in this game is that you cannot move in and out of stocks. Once you make a purchase, you hold those stocks until the end of the time period. Which one’s better? Well, that’s got to be a pretty obvious choice, right? Perfectly timing the bottom of dips seems like a no-brainer. However, the data says this turns out to not be true. 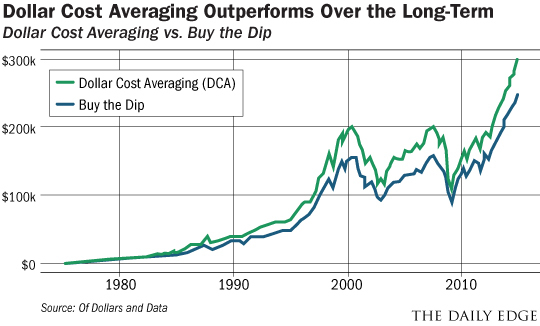 Take a look at the chart below that proves the outperformance of dollar cost averaging. Even if you timed every market dip to perfection, dollar cost averaging $100 every month still wins. As investors like my good friend Mike wait on the sidelines for the next dip, the market is likely to keep rising in the meantime. Therefore, even the dip-buyers who don’t get cold feet are often left behind as the dollar cost averagers build bigger and bigger positions in rising stocks. That’s why instead of working harder by trying to “time” the market like my good friend Mike, I recommend you try investing small amounts at a time in order to capitalize when stocks are moving higher, while also decreasing your cost-basis when prices are low. The numbers say this beats even the best-timed market buyers. The post Even God Can’t Beat This Simple Investing Strategy appeared first on Daily Reckoning.